We adhere to LEED requirements to provide our clients sustainable solutions. The Leadership in Energy and Environmental Design (LEED) certification program sets out strict guidelines and building standards for environmentally conscious building practices. By future-proofing our construction, Panache ensures lower energy costs and a smaller carbon footprint while incorporating new and exciting green technologies into each of our projects. LEED guarantees that the planning and construction methods of commercial projects are environmentally sound, energy- and water-efficient, and low emission. Air quality both inside the units and outside the building are tested throughout the building process to ensure adherence to LEED specifications at all stages of development, including during maintenance and operation after the project’s completion. Regardless of the scale of the undertaking, these guidelines provide a strict framework to have the lowest impact possible on the surrounding community and environment. In addition to environmental benefits, LEED requirements promise energy efficiency and air quality of the highest standard, using the latest in green technologies to bring down costs while increasing the workability and healthfulness of the space. Bringing in the newest technologies also means that maintenance costs will be lower over the life of the project, so the tools that bring you the best savings in the beginning will continue to provide for years. With reduced energy and water usage, lower maintenance and operation costs, and increased exposure to employees and tenants who value sustainability, LEED guidelines are beneficial for the environment and your bottom line. Materials used in construction are locally sourced, the project is designed to have easy access to public transportation to reduce emissions from commuters, and the air quality in and around the project is increased because of the focus on clean technologies. 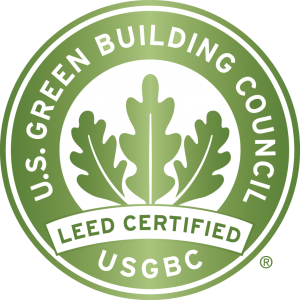 LEED is the definitive guideline for developers in the modern age, and Panache prides ourselves on our adherence to the strict requirements of LEED certification. What goes into a LEED project? Before construction begins, sites are scouted out and considered based on their proximity to public transit, availability of locally sourced materials, and the possibility of using any existing construction on the site to reduce the overall material count needed. This process ensures resource efficiency and delivers the largest margin of savings at all stages of development.